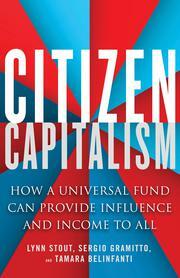 Corporations have a huge influence on the life of every citizen—this book offers a visionary but practical plan to give every citizen a say in how corporations are run while also gaining some supplemental income. It lays out a clear approach that uses the mechanisms of the private market to hold corporations accountable to the public. The Universal Fund is undoubtedly a big idea, but it is also eminently practical: it uses the tools of capitalism, not government, to give all citizens a direct influence on corporate actions. It would be a major institutional investor beholden not to a small elite group of stockholders pushing for short-term gain but to everyone. The fund would reward corporations that made sure their actions didn't harm people, communities, and the environment, and it would enable them to invest in innovations that would take more than a few months to pay off. Which is another reason corporations would donate to the fund—they could be freed from the constant pressure to maximize their quarterly share price and would essentially be subsidized for doing good.